With stories of identity theft and stolen credit card numbers occasionally making their way onto the news, it's hard to be confident using your debit card online. Using a debit card for online purchases is actually very safe though. Businesses and financial institutions are all just as concerned as individuals are about ensuring that online shopping is safe, so measures are regularly taken to protect consumers. Additionally, contrary to the myth that debit cards aren't safe, they are more secure than cash and there's a limit on what you're liable for if there is theft. 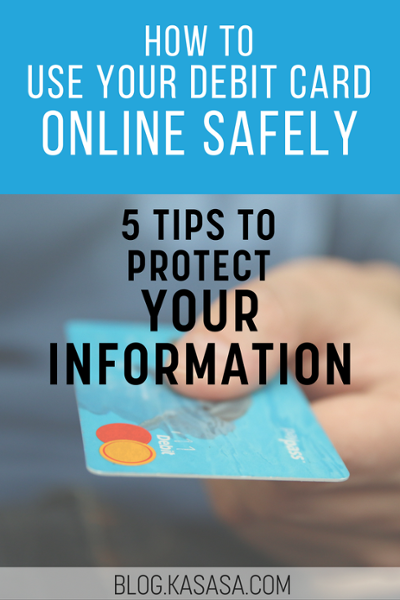 Even so, you can make sure that when you use your debit card online, you're protected. Just keep these key tips in mind. 1) Before you use your debit card online, be sure you're familiar with the brand. This is easy enough if you're buying something from a big, familiar brand like Amazon or Zappos. If you're interested in a product from a business you've never heard of before, take a few extra minutes to see what comes up for them on Google and Yelp. This is good advice for any shopping you do offline as well! Knowing the reputation of a business in advance can save a lot of headaches down the line. 2) Check that the website is secure and encrypted. The website address (URL) will now begin with https, instead of http. These are the signs that the website you're on has taken steps to ensure all financial information provided is encrypted for your security. 3) Don't shop on WiFi hot spots. The increasing availability of free WiFi at a wide range of locations like coffee shops, airports, and hospitals is designed to make our lives easier. The downside is, it also makes it easier for hackers to monitor and steal private information from users. You can decrease the risks of using your debit card online considerably by sticking to making your purchases from home, using your secure internet network. 4) Never provide your debit card information in an email. Every legitimate business selling products or services online uses a secure online shopping process to do so. This secure process never involves soliciting your credit card information in an email. All online purchases should be made through a secure online form. No company worth doing business with will ever request your credit card in an email, but scammers often do. Oftentimes, they do so by posing as more legitimate and familiar sources like the IRS, Apple, or Paypal. Even when an email looks like it comes from a source you trust, check the email address it comes from and avoid clicking directly on any links provided in the email. By doing a search on the link included in the email, you can both check its legitimacy and check to see if there might be any discounts available for the offer if it is legitimate. An example of a phishing email I received. Note how the email address is "support.com" not "apple.com"
5) Keep an eye on your account. Aiming for prevention is always best, but when that doesn't work, catching the issue fast makes solving the problem easier. If you notice and report any suspicious activity on your debit card within two days, the absolute most you can legally be left on the hook for is $50. If you utilize these five tactics when paying with your debit card online, you can rest easy at night knowing your dollars are safe. Thanks for commenting and passing this Wisedollar blog along. This blog is from a few years ago, so times have changed a bit. Our main goal for this blog was to inform readers who frequently use their debit cards online, easy ways to keep their information safe. Credit certainly provides you with an added layer of protection. Thanks!